Keep your magnetic spheres clean. 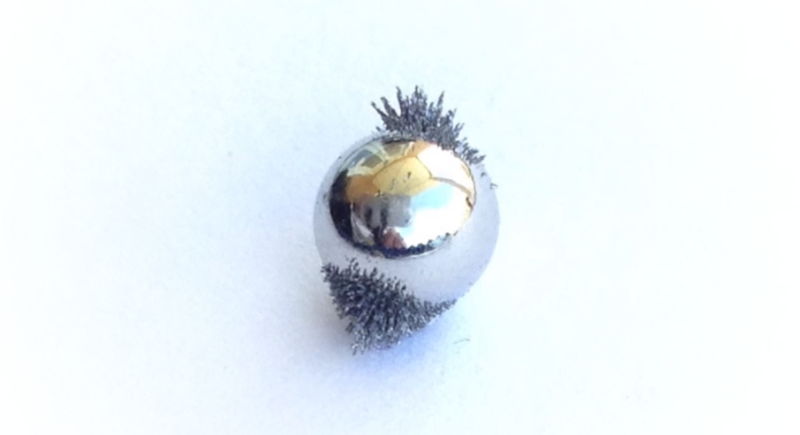 Without care, your magnets will be murdered by little ferric frackers, slowly forcing open the shiny flawless coating on your beloved magnet balls. Ever taken a magnet to the sand pit as a kid? Well, those small magnetic specs of dust, which used to be a fun visualizer of magnetic fields, are now the antagonists to the lifespan of your magnet spheres. And your magnets are only usable as long as the shield is intact. These little dusty devils will accumulate between magnets, eroding the poles where your magnets are most vulnerable. Attacking with every grind, mash, and knead, creating more bits of ferric betrayal from the coating itself. If ill-contained, the foe will sprout like a cancer, spreading, scratching, scarring your mirror coating beyond repair, forever. Ferric dust is everywhere, and the most important care is preventive. First of all, DON'T LET MAGNETS TOUCH THE GROUND. Doing so will bring shame and humiliation upon you. Most of these itty bitty particle invaders are invisible to the naked eye. If they have touched the ground, you can be certain that they've collected some ferric dust. If you do drop them, reset your browser history, quarantine the magnets away from the rest of the magnets, and completely clean the dirt infected magnets before they rejoin the pack. Even if you follow best practices of washing your hands and using a clean surface, you may still find that some ferric dirt has been pulled from the dust in the air. Easiest manual cleaning method. Takes 5 sec. Good for fine particles. First documented by EraZorX. Cleans and shines poles quickly but may require multiple passes for heavy soiling. Video by Brandon Hansen. Tape or electronics putty. Most effective for ferric particles, but slow, unless you make a tape board like MagnetNerd. 4. Microfiber Batch Cleaning Board. Zen Magnets have a harder coating than Eletroplated Neoballs have a harder coating than Polymer Neoballs. Zen Magnets will last a lifetime if well taken care of. But even if you have a different line of magnets, keep them clean if you want your investment to last. We rebuilt the back-end of the zenmagnets.com website. It's a fresh snappy hybrid with some modern content delivery network upgrades, compared to the embarrassing rusty '86 Buick that we painted over five times. About damn time.